These threads are widely used in the fabrication and sewing of anything requiring high temperature capability. They are used in our own fabrication shops and we have years of experience in knowing what threads are used for which applications. Available in nominal 1 and 2 pound spools, and smaller amounts may be purchased wound on standard or large bobbins for facilitating repairs in the field. Kevlar® thread is used extensively in the manufacture of protective clothing due to its resistance to chemicals and heat. Kevlar® thread has the highest specific strength of any commercially available fibre and, should an article be reinforced with Kevlar®, it does not break instantly but progressively, providing a non-catastrophic failure mode allowing a margin of safety. 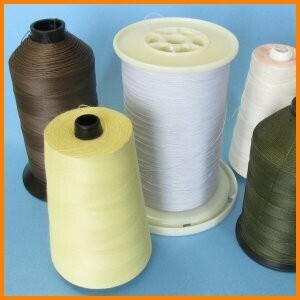 This innovative thread is also light and its strength to weight ratio makes it five times as strong as steel. Kevlar® thread has good thermal stability and retains a high percentage of room temperature properties even up to 300ºC after one to two hours exposure in air. It does not melt, or support combustion, but will oxidize at 400-430ºC. However, at temperatures as low as 196ºC Kevlar® shows no loss of strength. Kevlar® thread is an excellent resistor to chemicals and is unaffected by exposure to solvents, fuels, lubricants and salt water. Exposed Kevlar® can be affected by exposure to UV light but this is to the outer layer only and is not progressive. Nomex® is renowned for its flame resistant properties and is extensively used in the production of protective clothing, filtration and cabling. Nomex® compares favourably with nylon and polyester fibres due to its resistance to flexing. It does not melt and has extremely low flammability. At temperatures above 371ºC, the fibre degrades to a friable char at a rate proportional to the intensity of the heat source. Any flame produced during oxidation is self-extinguishing when the fibre is withdrawn from the source of the heat. With a good resistance to many chemicals, Nomex® is highly resistant to most hydrocarbons and many other organics solvents. Is also exhibits good resistance to alkalis at room temperature but is degraded by strong alkalis at elevated temperatures. It is unaffected by fluorine compounds that are present in gases from metallurgical and rock processing operations. Nomex® is degraded by ultraviolet waves of natural and artificial light; so where strength is of a critical nature, precautions should be taken to protect it from the direct rays of the sun and other sources of ultraviolet light. Nomex® does, however, have an outstanding resistance to radiation. PTFE coated “E-Glass” fiberglass sewing thread is made from continuous “E” filament yarns, resulting in a strong, chemical resistant textile sewing thread. The uniform PTFE coating completely encapsulates the thread, enhancing resistance to build-up of contaminates and repelling attack by most acids and alkalis. The smooth PTFE coating enhances the flexibility of the fiberglass yarn, making it suitable for many industrial applications and minimizing the tendency to kink, strip-back or break like other very high temperature threads. Ideally suited to static applications (safety spray shields, gaskets, heat shields, etc…). Where continuous flexing and bending is required, we recommend our “Beta / BC” R753-series product. D-12 Thread (part number FAB-TH-FG-12). D-18 Thread (part number FAB-TH-FG-18 ) Meets MIL-Y-1140C (Form 1, Class C). D-24 Thread (part number FAB-TH-FG-24) meets Meets MIL-C-20079 (Type 3, Class 3). PTFE coated “E-Glass” fiberglass sewing thread is made from continuous “E” filament yarns, resulting in a strong, chemical resistant textile sewing thread. This thread also includes an inconel wire insert for added strength and temperature range extension. uniform PTFE coating completely encapsulates the thread, enhancing resistance to build-up of contaminates and repelling attack by most acids and alkalis. The smooth PTFE coating enhances the flexibility of the fiberglass yarn, making it suitable for many industrial applications and minimizing the tendency to kink, strip-back or break like other very high temperature threads. This silica/quartz thread features high strength and a teflon coating to aid in sewing.